Football history is littered with examples of seemingly lost causes rescued by a great redeemer, situations that appear hopeless being turned around by somebody who knows exactly what they're doing. The message from Celtic Park, in the wake of the announcement of Ronny Deila's exit at the end of the season, was one of calm and an insistence that they know what's gone wrong and they know what needs to happen in order to fix it. As chief executive, Peter Lawwell has been caught in the fallout of Sunday's loss to Rangers in the Scottish Cup semi-final. 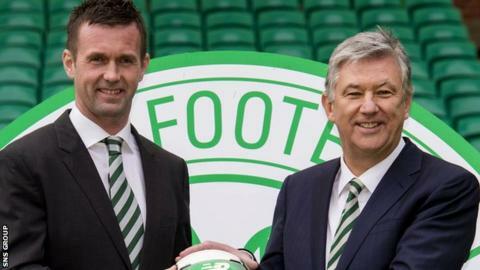 There have been calls for his head as well as Deila's, but Lawwell is probably less likely to leave now than he has been at any point in recent times. Lawwell - and all people in his position - think about legacy. They all want to leave on a high, serenaded out on the back of a big feel-good moment. Lawwell is not likely to have Deila as the full-stop on his years at Parkhead, even though Deila was his appointment. That's where the pressure comes, though. His next decision is a monumental one - and he'd better get it right. If he doesn't then you wouldn't bank on him leaving on his own terms. If he does, and a winning manager is the result, then everything else fades away - all the supporter disaffection, all the issues about stockpiling players, all of it. There were huge doubts swirling around Celtic Park in the dog-days of Tony Mowbray's reign but Neil Lennon took over and took things forward. Rangers could scarcely have been at a lower ebb than a 6-1 aggregate loss to a poor Motherwell side at the end of last season but Mark Warburton, in rapid time, turned it around. Good managers are like that. They have a touch of magic about them - they make other problems disappear. The names of possible successors are coming thick and fast - David Moyes is, by the looks of it, fluttering his eyelashes at Aston Villa and Celtic. Lennon has made it clear that he would be happy to talk about a return. Malky Mackay has already let it be known that he would love the job. Alan Stubbs was considered a contender in the media a few months ago, then was written off when Hibs hit the wall, and might yet be a contender again if Hibs win the Scottish Cup and get promotion to the Premiership. Northern Ireland manager Michael O'Neill has been mentioned. Roy Keane was offered the job before Deila and he's on the betting short-list again now. Before this is done, there will be other names - many, many others. Keane's recollection of the summer of 2014 is interesting. It comes from his book, The Second Half. "I got a call: would I go and have a chat with Dermot Desmond," Keane wrote about the time he was approached to succeed Lennon. "At the end of the chat, [Desmond] said: "The job is yours.' It was all pretty straightforward. There'd be one or two restrictions, about staff. They'd already picked the man who'd be my assistant, and they were insisting on him. It didn't scare me off, although it did get me thinking. "It wasn't an ideal start. Were they doubting me already?" One lesson, of many, that needs to be learned is that the new manager should pick his own staff. Keane's story continued. "Over the years, when chatting with people about football and Celtic, I'd always said, 'If you're offered the Celtic job, you don't turn it down'." When he started talking to Lawwell, though, Keane began to have doubts. "I thought about the Celtic offer. It wasn't rocking my boat. They weren't convincing me - 'Listen, you're the man for us.'" Keane concluded that had there been a bit of what he called "give and take", then it might have been different. "Celtic didn't give me enough of a headache," he wrote. "They just didn't show me that they wanted me." Will Celtic approach Roy Keane again? It's a moot point about whether Keane would have been any good as Celtic manager, but if that's the manager Desmond wanted then the pursuit of him of was strangely lukewarm. They ended up with a young and compliant manager, a worthwhile gamble but a punt that has led them to this point. Celtic's negotiations with their number one choice would need to be a whole lot more convincing this time around. The situation that they're in now is not dissimilar to the one that Lennon inherited post-Mowbray. Against Rangers - and in too many matches preceding Sunday - Celtic looked like a team existing on reputation alone, tired champions vulnerable to the challenge of hungrier opponents. Lawwell has been pelted with flak but this one is on Deila. Celtic have a battalion of players and, in relative terms, a lavishly assembled squad, but they were sent out on to the field in poor shape. There is an argument - and it's hard to disagree with it - that if Warburton had switched hats, magic or otherwise, and was Celtic's manager, with all those players at his disposal, then the result would have been very different. When it comes to auditing Deila's time as Celtic manager the ledger is lopsided, the debits outweighing the credits to such a vast extent that the Norwegian could have no legitimate excuses when the announcement came. You have to mine the records pretty thoroughly to find the marquee results on Deila's watch. In truth, there wasn't a single one that made you go 'Wow!' There were moments of optimism domestically, but that's a given when you're Celtic manager. In Europe - what Celtic like to think of as their true testing ground - they have gone hurtling backwards. There has been a haplessness in the transfer market that further undermined his position as Celtic manager. The hierarchy at the club have denied, on several occasion, that players were signed for Deila. They say that all players who came in did so with his approval. If that's the case then the charge sheet against him is a long one. Celtic have lost their way, that's obvious. They have given game-time to 34 players in the Premiership this season. Leicester's number, by comparison, is 23. No side in the top three of any of the major leagues in Europe have used anything like Celtic's number in their domestic league. The average is 24. Of course, these clubs can afford to buy ready-made players, dependable talents who don't need to be developed. It's easy enough to operate with a smaller group of players if you're shelling out multiple millions on most of them. Celtic are supposed to be all about development. Fine. Their counterparts might be PSV and Ajax and Feyenoord from the Netherlands or Benfica, Sporting Lisbon and Porto from Portugal or Bruges and Gent from Belgium. Gent made the last 16 of the Champions League. None of those teams have used as many players in their league as Celtic have this season. PSV have used 23, Ajax 25, Feyenoord 22. The strange irony is that for all their bodies at Celtic Park they are ludicrously thin on strikers - effectively they have just one - and, also, some of the talented young players they're wanting to develop have barely featured. Scott Allan has had one start. Ryan Christie hasn't even had one. A good manager can bring clarity to all of this. Finding him is the challenge. Celtic's gamble on Deila has failed. They cannot afford to fail again.